I know this is another non-traditional post, but what can I say, my life has been a little non-traditional lately! Since our schedules have been laid back, with no major exams looming over our heads, John and I made a goal to see all of the Oscar nominees for best picture before the big event. (We love movies, and $5 movie night on Tuesdays is hard to pass up!) We got to 89% of our goal – seeing all but Amour before the awards began. Amour was a hard movie to track down, especially in a small place like Toledo, OH. I was kind of bummed about not batting a thousand; but after seeing how depressing it looked, I’m kind of glad that’s the one we missed. 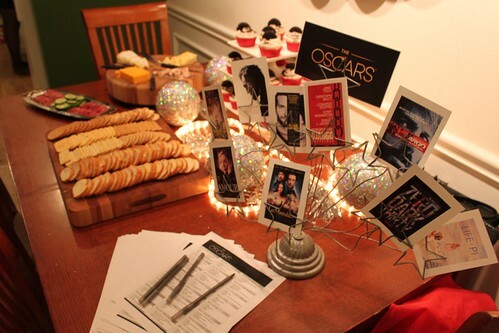 To honor our movie loving nature, and to have some extra fun on a Sunday night, we decided to have an Oscar’s Party – which I’m hoping is something we can make an annual event! I had a ton of fun planning the food, decorations, and watching the winners announced with my own ballot made it quite a nail biting experience! 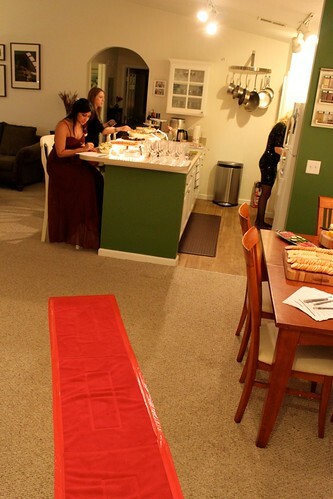 I would like to take credit for the decorations, but truthfully, when my mom heard about the party she sent me home with a box of ideas, and then a few days later I got a “red carpet” in the mail ;-). 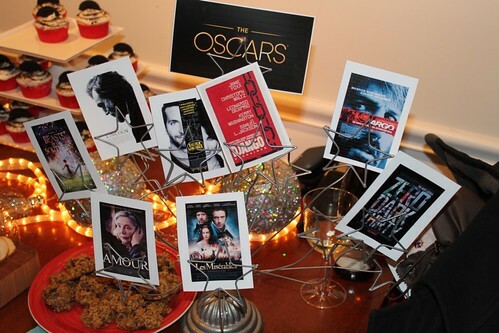 My personal favorite was this centerpiece that included miniature movie posters for all 9 of the best picture nominees. I simply went onto ABC’s website and printed the pictures of each nominee on photo paper, as well as the Oscars logo. 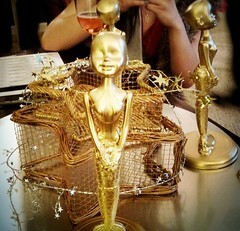 Then of course there was the star of the show – The Oscars themselves. 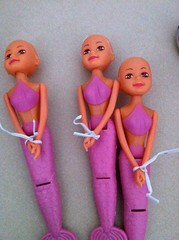 John can take complete credit for turning these mermaids from the dollar store into masterpieces. 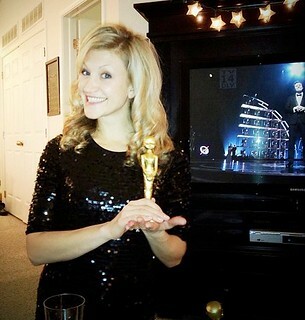 I’m quite sure you could buy some imitation Academy awards, but this was much more fun, and I’m sure less expensive. 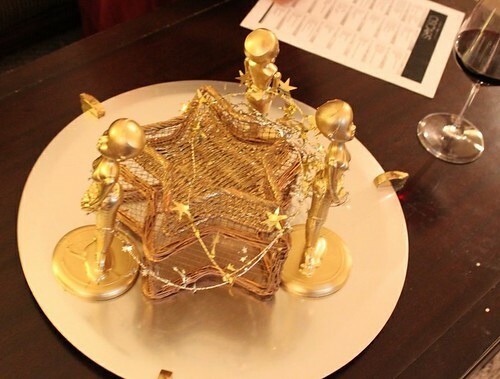 These also served as first, second and third place prizes for the winners. 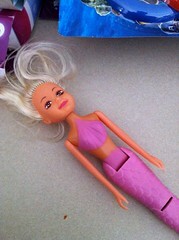 The mermaids were $1 each, and then we also bought some mini frisbees to serve as the bases. John pulled the hair off of them, tied their hands together (creepy, but necessary), and then hot glued the whole thing in place. He put 3 coats of a Rust-Oleum Metallic Brass Spray paint over the whole thing. In retrospect, you could see the glue much more than anticipated, but they still looked really awesome, and a lot funnier then store bought awards. It’s amazing what a can of spray paint can do! Then there was the red carpet, which was actually made of 3 red bath mats (found at Marc’s), taped together with some duct tape. We made sure to wash these before placing them on top of our carpet, since cheap bright red towels can bleed. Next time I really want to take pictures of people coming in on the carpet, but there is just so much going on at the start of a party. I wanted to keep the menu classy (this is a red carpet affair after all), but also reasonable in price and manual labor. Appetizers for a big group can be very time intensive, so I tried to limit the number of things that had to be individually assembled. If you have questions about any specifics, feel free to ask. 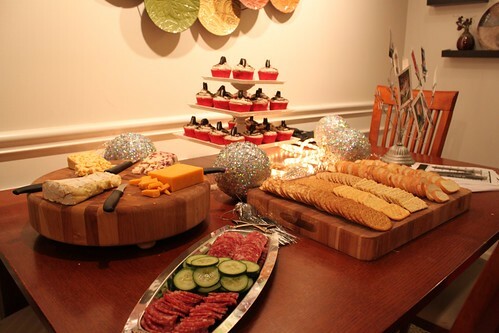 The cheese and dessert table. Rope lights are a really fun and easy way to make the whole event “sparkle”. A few of the appetizers sitting out, and some serious ballot decisions in the background :-). 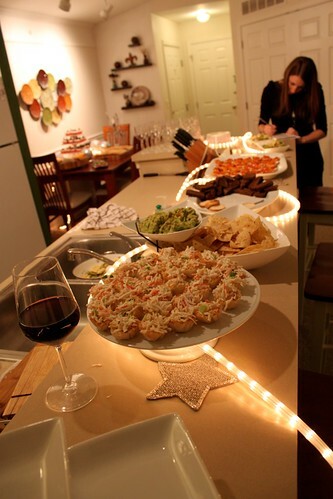 With last minute prep, welcoming people, and trying to have fun, I didn’t get to take any close up pictures of the appetizers in order to post recipes. I figured I’d just post about the party in general, because it would gives me something to improve upon for next time, and it’s a good way to remember where to start. Since I made the cupcakes especially for a friend’s birthday, I do have some pictures of those, which I will be posting, along with the recipe about shortly! Stay Tuned! Overall, it was quite a hollywood affair :-)! Between pinterest, google reader, and an ever growing cookbook collection, I read a lot of recipes. Usually I file them away so that I can peruse my favorites when trying to plan a menu. But every once in a while a recipe is so memorable that it pops into your head a whole year later, while at the grocery store frantically trying to finalize the memorial day barbeque. This recipe would fall into that category. 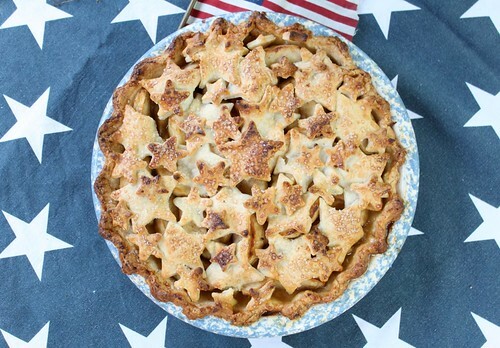 Normally I wouldn’t think of apple pie as a traditional Fourth of July dessert, but a star spangled apple pie – well that’s entirely patriotic. It’s amazing what a few star cut outs can do for the “festive” level of a dessert. Served with ice cream, a possibly a slice of cheddar cheese, it’s perfect for summertime. 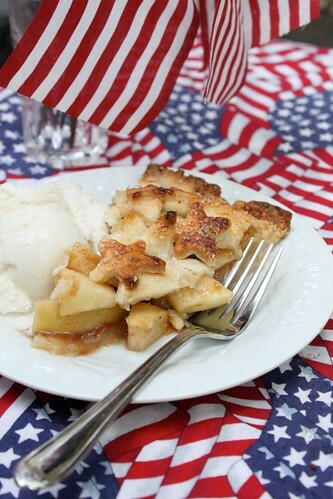 And after all the saying does go, “As American as apple pie”. The other thing I really liked about this recipe was how simple it was – most of the ingredients you probably already have in your pantry. 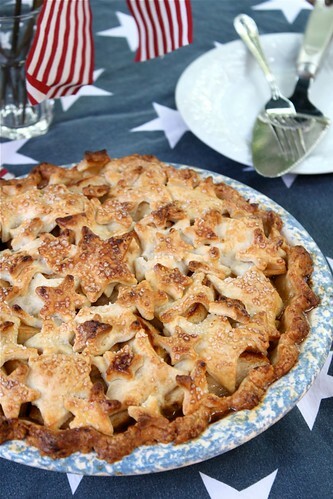 But since the crust is really the “star” in this pie, I think a homemade one is almost imperative. I had a little bit of trouble with overbrowning, so next time I make this I plan to tent some foil over the top to help even cooking. As you may know, I’m somewhat partial to sugar, but I truly did think that the sugar crystals elevated the crust from good to great, and would probably add even more when I make this for the next patriotic holiday. On a lightly floured surface, roll out half of the pie dough into approximately a 12-inch round. (Keep the other half of the pie dough chilled for now.) Transfer the dough to a 9-inch pie plate, trimming the excess and crimping the edges. 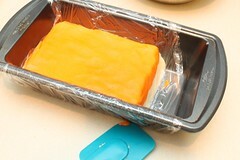 Cover with plastic wrap and freeze for 30 minutes in order to help the crust hold it’s shape while baking. Preheat the oven to 400˚ F. In a large mixing bowl, combine the sliced apples, sugars, flour, spices and lemon juice. Toss well to combine. When the bottom crust is finished chilling, pour the apple mixture and accumulated juices into the bottom pie crust and use a spatula to even the top out slightly. Place thin slices of cold butter over the apples. Roll out the remaining pie dough on a floured work surface. Cut out numerous star shapes and use these to cover the top of the pie, using as much of the dough as possible. 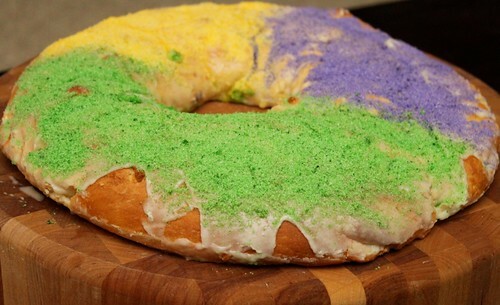 Brush the top and edges of the crust with the egg wash, then sprinkle with coarse sugar. Place the pie on the upper rack and bake until the crust is golden brown and the juices are bubbling, about 50-60 minutes. 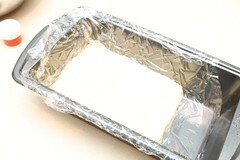 Watch carefully and tent with foil for the 2nd half of baking if necessary to prevent overbrowning. Transfer to a wire rack and allow to cool for at least 30 minutes before slicing. Serve warm or at room temperature. Wishing you and your families a wonderful new year! 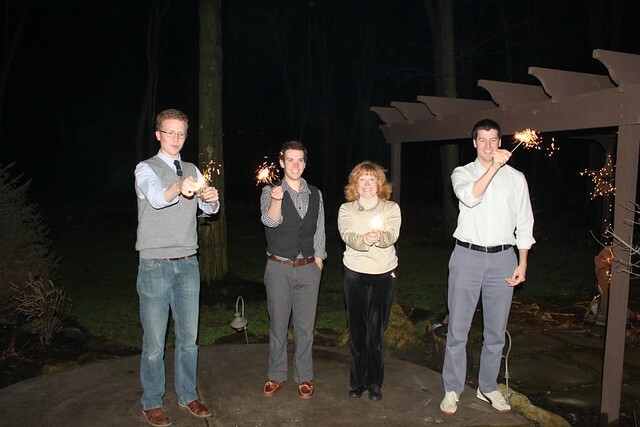 I was really excited about this picture we took last night with sparklers and so wanted to share it. The models are doing the exact same thing in both pictures- writing 2012. You just need to make sure your flash is turned off and you have a long shutter speed to capture all the movement in one frame. 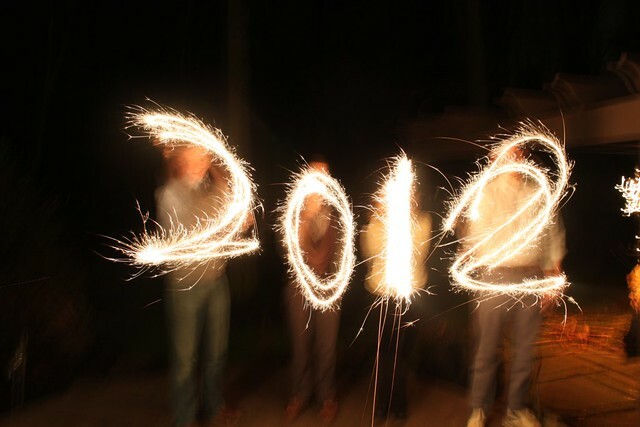 I’m pretty sure we’ve found a new new years tradition! 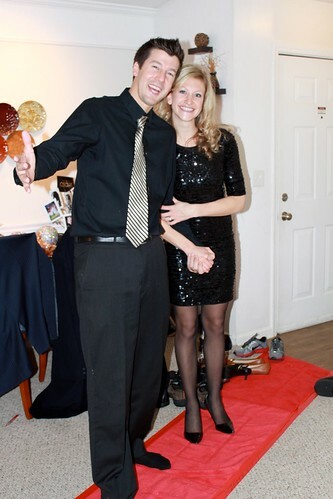 Hope you all had a wonderful new years eve! At first I was kind of bummed when I got assigned Neuro-Psych for my second rotation block – namely because I really wanted to get one of the very time intensive, 10 week long rotations out of the way earlier in the year. However, I’m learning that everything works out in the end because I have truly loved having some free time to enjoy the fall. (Remind me of this when I am waking up for surgery at 4:30 and driving through a snowstorm). Beyond the obvious fall cooking adventures, I have really enjoyed running in the park, which has been continuously blanketed with colorful leaves for several weeks now. Every time I enter Wildwood I think, ” I wish I could take my camera on runs” or “I really need to get John out here to see this before its gone”. (He gets a little reluctant to go running….well usually…..but especially when the weather drops below 70º ). I’ve managed to get him out a few times though and it has been truly gorgeous. In celebration of the wonderful season, we had the pleasure of attending a bon fire and a halloween party. I really wanted to impress with my improving cookie decorating skills, but unfortunately I forgot how long it takes to work with royal icing. I managed to finish a few cookies to bring over, but if you really want to use royal icing, plan on making the cookies the night before. 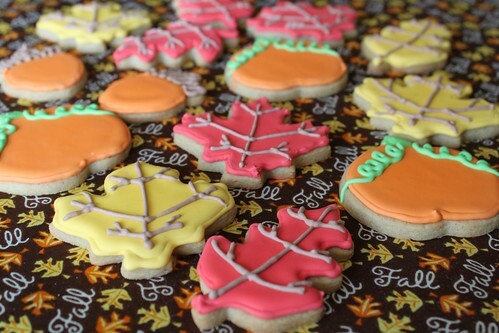 Nevertheless, I thought that these were a perfect autumn treat- just a hint of spice, but enough to remind you of fall. I’m hoping to make them again to take down for thanksgiving (especially because the 3 cookie cutter set I bought also came with a turkey!) Any icing will work for these, but if you plan on using royal icing check out my tutorial for instructions. Roll dough to 1/4 inch thickness and cut into desired shapes. Let cool on cookie sheet for 1 minute. Then transfer to a cooling rack to cool completely. Ice the cookies as desired. Based on my experience thus far in life, I can firmly say that you can never go wrong with pumpkin flavored anything and cream cheese frosting. 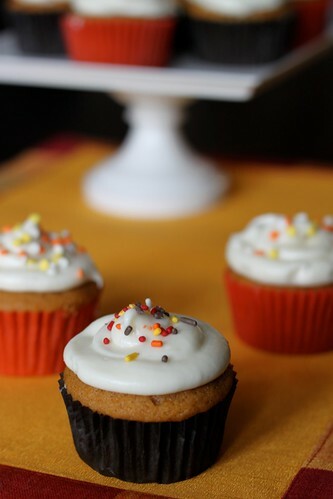 I made a different version of these cupcakes last year, and there are a few things I liked about each recipe. Last year’s recipe was ridiculously moist, but almost to the point where the cupcakes stuck to the wrapper and couldn’t support the weight of the frosting when you went to take a bite. I liked this new recipe because the cupcakes are a little bit sturdier, and you don’t have to use part of a box of cake mix (what does one do with a left over 2/3 cup of cake mix? ). 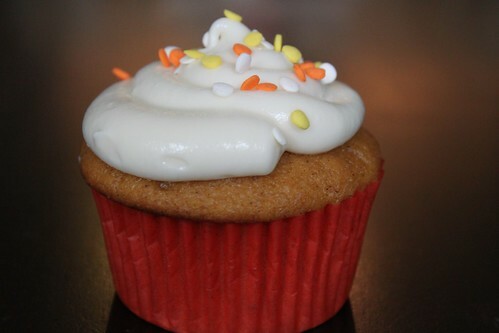 Plus, when I’m going to the trouble of making cupcakes from scratch I really prefer ones made with unique ingredients that wouldn’t be part of a box mix – like butter instead of oil and buttermilk for some extra moisture. 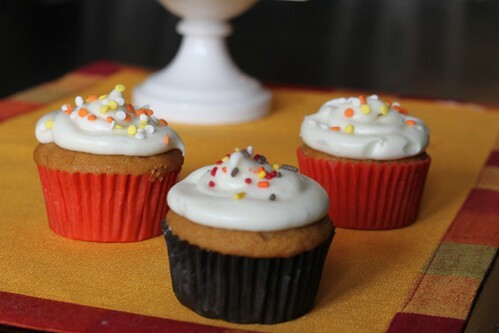 I used to think that recipes that called for buttermilk were a bit annoying because you generally have to buy a whole quart, but I’ve found it lasts a lot longer than milk (like over a month) and I’ve found several other things to do with it in that time – like John’s birthday cake, ranch dressing, and then these cupcakes. But as I said before, you can’t go wrong with pumpkin and cream cheese so if your so inclined, try both recipes! I actually made these for the children’s Halloween party that our medical school hosts every year. 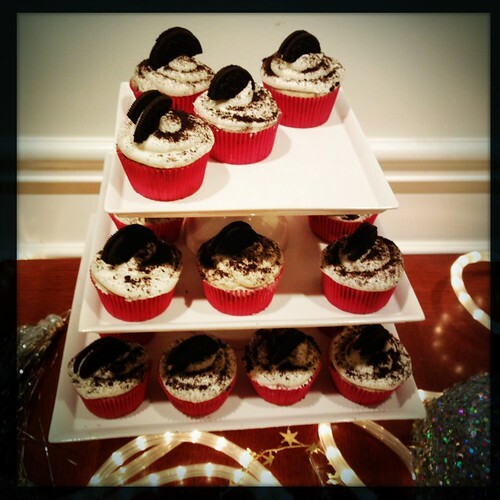 Now technically this party if for children with diabetes, and while you might think cupcakes wouldn’t be the best idea, the point of the party was to help the children learn how to balance their carbohydrates with their insulin. 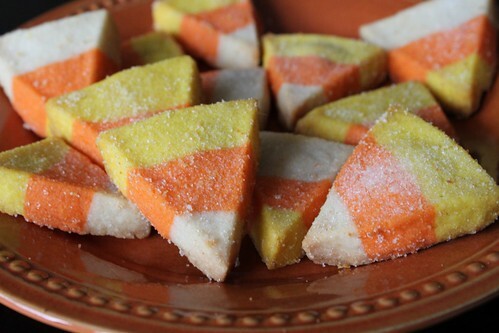 (And it is really hard to find low carbohydrate halloween desserts). So I made a double batch of these cupcakes, and calculated that each cupcake with frosting has 35 grams of carbohydrate. I got about 40 cupcakes from the double batch, and saved a few to take with us to Cincinnati for my now living in Ohio brother and sister -in-law. These went so fast that I’m pretty sure my father-in-law thought he wasn’t going to get one. Apparently they were also a big hit at the halloween party – but really what kid can resist sprinkles? Line two muffin pans with cupcake liners; set aside. In the bowl of a stand mixer fitted with the paddle attachment, cream together the butter and brown sugar until light and fluffy. Beat in the eggs one at a time. Mix in the vanilla until fully incorporated. In a separate mixing bowl, whisk together the flour, baking powder, baking soda, cinnamon, nutmeg and salt. In another small mixing bowl, combine the pumpkin and buttermilk until smooth. Turn the stand mixer on to the lowest setting and alternately add the dry ingredients and the pumpkin mixtures to the creamed butter. Start and end with the dry ingredients. Mix until just combined. Spoon the batter into the pans, filling about 2/3 full. Bake for 20 minutes, or until a toothpick inserted in center comes out clean. Allow to cool enough to handle and then move to a cooling rack. 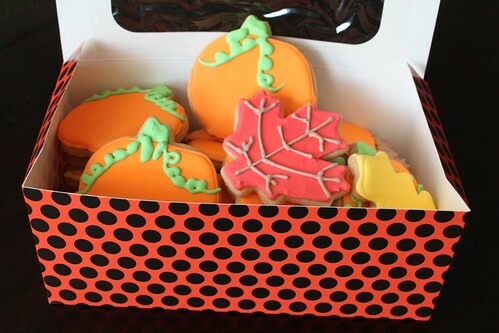 Store in airtight containers until frosted. Store frosted cupcakes in the refrigerator. Cream the butter, cream cheese and vanilla together on high speed. Add the powdered sugar, a small amount at a time and blend until smooth and creamy. To ice the cupcakes using a pastry bag, chill icing in the refrigerator or freezer for about 15 minutes in order to harden the icing enough to frost. Alternatively, frosting can be added immediately to cooled cupcakes using an offset spatula. These cookies don’t even need an explanation. I mean seriously. 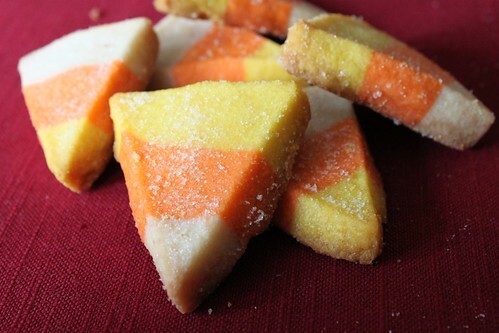 They look like candy corn, they are ridiculously simple and they taste delicious. I scrolled through the instructions at Our Best Bites, and after seeing how creative (and easy) they were, I immediately started making the dough that same night. 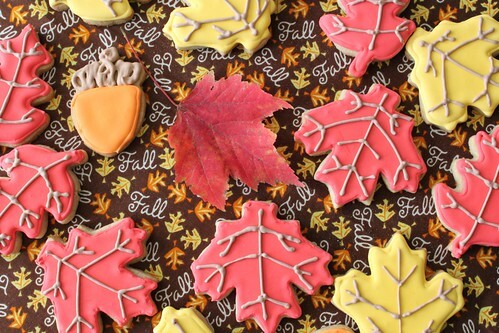 Never mind that it was 11pm on a school night – these cookies had to be made. Plus, it took me less than 30 minutes including cleaning time to whip up this dough and put it in the fridge. I really think the pictures are the most helpful part in figuring out how to make these. I tried sprinkling the cookies with plain sugar, and I wasn’t really a fan of how that looked. I think when I make these again that I am going to either leave them plain or use large sugar crystals. The most important part in the apperance is not overcooking the cookies – they look much better with no browning. Keep in mind that you can use any recipe for the cookie dough – I just chose shortbread because I knew they weren’t going to have icing and I wanted a cookie that would still be delicious. And of course I trust Ina Garten with any recipe that includes lots of butter. I loved this shortbread recipe, and apparently so did the rest of the family because they were gone in less than 2 days. Don’t worry – it wasn’t just me and John we had some new to Ohio and visiting Ohio helpers :-). 1) In the bowl of an electric mixer fitted with a paddle attachment, mix together the butter and 1 cup of sugar until they are just combined. Add the vanilla. In a medium bowl, sift together the flour and salt, then add them to the butter-and-sugar mixture. Mix on low speed until the dough starts to come together. Divide the dough evenly into 3 separate bowls. 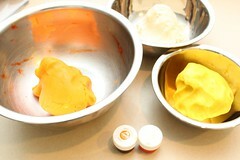 Using gel food coloring color 1 bowl of dough orange, 1 bowl yellow and leave one uncolored. Mix until the colors are thoroughly incorporated. 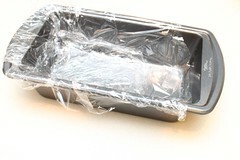 2) Line a baking pan with plastic wrap (smaller pans work best if you have one). 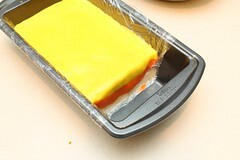 3) Press the plain colored dough into the bottom of the pan, spreading to an even layer. I did not fill the entire length of the pan because I wanted slightly taller cookies. Continue with the orange and then the yellow layers. 4) Refrigerate the dough for 1 hour, or up to 3 days. You want the dough to be firm and easy to cut. 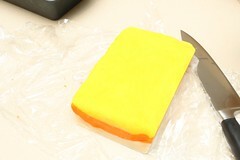 Once chilled, remove from the pan and place on a cutting surface. 5) Slice the the dough into a 1/2 inch wide slice. You may also want to cut a straight line across the top yellow layer in order to get a more finished look. 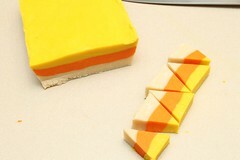 Then cut diagonally through the slice in order to get 5-6 pieces of candy corn. You may have some small, not perfectly shaped pieces at the edges, but that’s okay – they still bake up nicely and someone will eat them. 7) If you have coarse sugar, you can sprinkle the piece with sugar. Place on a baking sheet and bake for 18-22 minutes. Do not over bake or they will become discolored from browning.